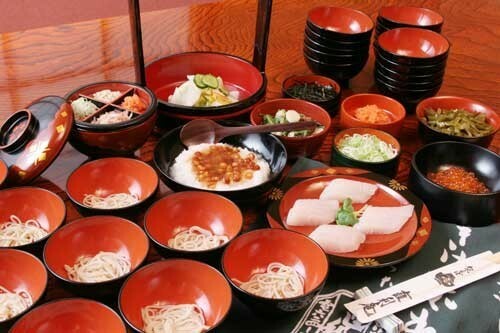 The Wanko-soba is a famous aspect of food culture in Japan. 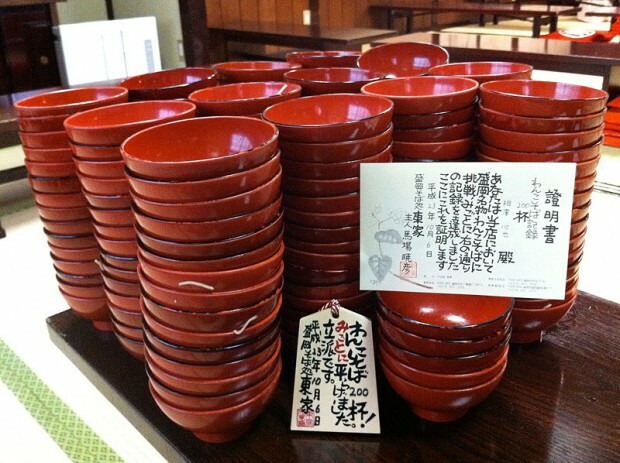 It means “the soba which entered the wooden bowl”. Soba for one share is put in the small wooden bowl. It is the style that the next soba is added to whenever finish eating. And I eat soba in sequence and put a not crowded wooden bowl and count a number last. A feeling of the Japanese “hospitality” (OMOTENASHI) is a beginning of “the Wanko-soba”. It is not a gluttony meet. It is the culture that came out of a feeling to be considerate of a partner peculiar to Japan. The good person eats to swallow it with good rhythm. In the shop providing Wanko-soba, most are flat rate. In other words, it is served unlimitedly! The person eating a lot is very nice service. In some shops, lead to the large room. If some number of people gathers, start at the same time together. It is a feeling participating in a show. It is popular among the travelers from the foreign countries as “entertainment of the soba” recently. Several kinds of spices are prepared for by one’s seat. You can eat even several cups without getting tired. It is a start if I open the cover of the handed wooden bowl. You are innocent, and please continue eating! While a person of the supply shouts, I put additional soba. And close the cap of a wooden bowl if had enough. It is crack of doom to close the cap. It is no use even if I say, “I cannot eat anymore it!”. As the soba is added unless I close a cover, it is to watch out. Finally oneself will count whether you ate several cups. This is the first pleasure of the Wanko-soba. As for the average, “70 cups a woman” are “50 cups a man”. Get a souvenir when I eat 100 cups in many shops. A shop of the most famous Wanko-soba. As it is light-seasoned, it is easy to eat quantity. Get a commemorative article when eat more than 100 cups. The shop which poet, Kenji Miyazawa from Hanamaki visited. He always ordered “tempura soba and soda water “. Oshibori. Always supplied at Japanese restaurants.